Trade season is heating up and like most contenders, the Baltimore Orioles find themselves only a few weeks away from the trade deadline with areas for improvement. Second base happens to be one of those areas. With talented rookie Jonathan Schoop struggling offensively, the team could use an upgrade to increase their chances of a playoff run in 2014. Today over at ESPN Sweetspot Network Oriols blog Camden Depot, I explain why acquiring Martin Prado solves their issue at second base in 2014, but also takes care of potential roster problems in the future. This is an Orioles blog. However, if you remember correctly, I’m actually a Phillies fan, so let me take a moment to talk about the Phillies and Chase Utley. After I let out a good cry (in the form of words), I promise I’ll compose myself, circle back around, and tie this post back to the Orioles. Despite winning 9 out of their last 13 games, and arriving at the All-Star break playing .500 baseball, the Phillies are not a playoff team. In fact, they are not even close to being a playoff team. And as bad as it sounds, I am praying there will be no winning streak leading up to the trade deadline, which somehow leads to adding players at the trade deadline for a foolish run at a playoff spot that won’t be there at the end of the season. The team is old and injury prone, the payroll is bloated, and the farm system is (for the most part) empty. Prolonged success, years of trades to boost the major league club, and keeping a core group of aging players together for multiple runs at championships will do that. Also, paying a closing pitcher (ANY closing pitcher) $50 million over 4 years doesn’t help either. If I went on a train of thought rant on the Jonathan Papelbon contract right now, you would probably have to read several more pages until I actually got to the point. But lucky for you, I’m showing restraint (actually, more likely lucky for me, because you’d probably just stop reading). Yes the Phillies should be selling. They may have a 48-48 record, but are playing like a team that should have a 43-53 record (scoring 45 fewer runs than they have allowed). They are 6.5 games out of first place, 5.5 games out the 2nd wild card spot, and according to ESPN, they currently have an 8.2% chance at making the playoffs. This is where Chase Utley comes into play. If the Phillies do end up selling at the trade deadline, Chase Utley would be one of the prime candidates to be wearing a different uniform by August 1st. The thought of Utley being traded is particularly sad for me (and I imagine the majority of Phillies fans), as he has been my favorite player since the days of my youth when I idolized Mike Schmidt. While it seems like he was sometimes underappreciated throughout his career, he is easily the best second basemen the Phillies have ever known. And with a couple more productive years, he should be a legitimate Hall of Fame candidate. How good has Chase Utley been over his career? Since he debuted in 2003, his 54.0 career Wins Above Replacement, according to Fangraphs (fWAR) is 3rd among all position players, behind only Albert Pujols and Alex Rodriguez. What’s even more amazing is that he’s accumulated that total while ranking just 48th in games played over that same period of time (due to injuries in 2010-2012). Among second basemen, he leads the next closest on the list (Robinson Cano) by 19.1 fWAR, despite playing 50 less games. Utley’s peak years were from 2005 to 2009, where he accumulated 37.7 fWAR, second to only Albert Pujols, who accumulated 41.2 fWAR during that period. Scouts rank players on a 20-80 scale, with 20 being terrible, 80 being excellent (and rare), and 50 being average. Even in his prime, Eric viewed most of Utley’s tools as average or above average. But let’s take a look at Utley’s hitting, running, and fielding a little bit more closely, because his game is more than just his baseball abilities. First let’s take a look at his hitting. It’s common knowledge that Chase Utley is a great hitter, especially for a second baseman. But how great of a hitter is he? In every year from 2005-2009, Utley compiled statistics that consisted of (at a minimum), a .280 AVG, .375 OBP, .500 SLG, and a .200 ISO. Below is a table of second basemen in the history of baseball who have compiled all of those statistics in a season, and the number of times they have accomplished it. Out of all the second basemen in the history of baseball, only Hall of Famer Rogers Hornsby has accomplished that feat more often than Utley. 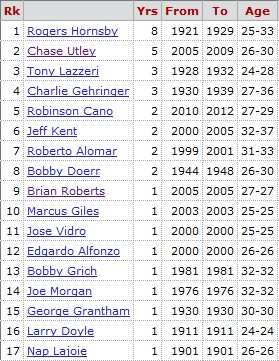 Only one other player has exceeded Utley’s combination of ability to hit for average, power, and to get on base. The Chase Utley of 2005-2009 is no longer around, and it’s very unlikely he will ever return. Even so, Utley remains a very productive hitter, and is ranked 7th in wOBA for second basemen in 2013. Whether you knew it or not, since 2003, the Phillies have had one of the best overall hitting second basemen of all time playing for them. Period. Now, let’s talk about his running. Chase Utley has average speed, yet he is also one of the best running second basemen in the history of the game. According to Fangraphs, he has accumulated 44.5 baserunning runs (BsR), which is good for 4th place among all second basemen since 1951. Each of the players listed above him except one have played at least 500 more games than Utley, and the only one who hasn’t is Tony Womack, who owns a career fWAR total of 1.7. Additionally, while Utley may not steal a ton of bases, when he does, you can almost guarantee that he won’t get caught. He ranks 2nd in stolen base % among ALL players since 1951 (minimum 80 stolen base attempts), safely stealing a base 88.89% of the time. Finally, we’ll take a look at his fielding. Despite being scouted as only an above average defender, and never winning a gold glove, Utley has been the best at fielding his position over his career as well. Since 2003, he’s accumulated 144 Defensive Runs Saved (DRS) at second base, which is ranked first by 27 runs. He also tops the list of UZR/150 at 13.9, leading Dustin Pedroia (ranked 2nd) by 4.3. I think I’ll stop there, because if I keep going, this is may start to turn into Mac’s letter to Chase Utley in “It’s Always Sunny”. Bottom line, Chase Utley is good at baseball, and is easily the best Phillies player in an era when there were a lot of good Phillies players. As a fan, it’s difficult to imagine trading Chase Utley. However, from a baseball perspective, it makes a lot of sense not only from the team’s perspective, but from the player’s perspective as well. 1) His Contract – Utley is in the final year of the 7 year, $85 million contract he originally signed in 2007. There is no guarantee that he will be open to signing another contract with the Phillies, and due to his injury history (and the team’s payroll situation), the team may not want commit to the number of years or dollars he would like. Additionally, the Phillies have two in house candidates who could potentially replace Utley next year if he were to leave (although neither Freddy Galvis or Cesar Hernandez are close to the caliber of player Utley is). 2) While Chase Utley won’t ever be able to repeat the production of his peak years, he is still a very valuable player that many teams would want for the pennant race, and the Phillies may be able to get a decent return in prospects for him, which could help boost their very weak minor league system. Despite his injury history, he has managed to stay relatively healthy this year and has been the 5th most valuable second baseman in the entire league (according to fWAR), despite missing 28 games for a ribcage injury. I would imagine teams are happy that there’s been no knee trouble, and probably don’t view the ribcage injury this year as a concern. 3) If Utley is traded, the Phillies could potentially re-sign him in the off-season. I feel like this would be unlikely, but if he enjoys playing in Philadelphia, the Phillies may be able to get Utley back while re-stocking the farm system at the same time. 1) Obviously, the first reason for Utley to accept a trade would be the opportunity to play in a pennant race. Every player wants to win, and Philadelphia is probably not the place to have the best chance at that this year. 2) According to the new Collective Bargaining Agreement between the players and the owners, Utley has a financial incentive to accept a trade. If he’s traded this year, he would not have draft pick compensation tied to him in the offseason. It’s slightly more complicated than this, but if Utley is traded, the team signing him for next year would not have to give up it’s first round draft pick in 2014 as a result. On the other hand, if the Phillies keep Utley and extend a qualifying offer in the offseason (a 1 year, approximately $13 million contract), Utley’s rejection of that offer would tie him to a draft pick. In recent years, teams have been increasingly reluctant to give up draft picks to sign certain free agents, and as a result, Utley’s market in the offseason would definitely shrink. 3) As mentioned above, Utley could always re-sign with the Phillies in the offseason if he enjoys playing in Philadelphia, while getting the benefits already mentioned. Looking at this situation from a rational standpoint, trading Chase Utley makes too much sense. As mentioned above, there are many contending teams that could use a Chase Utley to help their chances in a playoff race, one of whom would be the Baltimore Orioles (see, I told you I would tie this back to the Orioles). The Orioles currently have a mix of Brian Roberts, Alexi Casilla, and Ryan Flaherty manning second base. Casilla and Flaherty have been great in the field this year, but each has struggled at the plate. Roberts on the other hand, has just returned from another injury and no one is really sure how much he’ll contribute. In the 66 games following the All-Star break, Dan Szymborski’s Zips Projection system at Fangraphs projects the combination of Baltimore’s current second base options to contribute a total of 0.2 WAR over the remaining games this season. On the other hand, Zips projects Utley to contribute 1.4 WAR throughout the rest of the season. Utley’s projection may be a little low as well, since Zips only predicts Utley playing in 43 of the remaining games. Due to his injury history, Utley does require more days off than he used to, but in the American League, some of those off days can be replaced with days spent at DH, another position the Orioles need to upgrade. Utley’s WAR projection could increase by 0.25 or more with 10 more games of anticipated playing time. The net 1.2 wins (or more) that Utley could provide to the Orioles during the second half of the season could be critical in what will surely be a tight playoff race down the stretch. What would it take to get Utley from the Phillies? Probably not as much as you think. There are reasons the Orioles (and other teams) should be cautious when trading for Utley, the first and foremost being his injury history. Another reason is the money that he would be owed. Utley makes $15 million this season, so depending on when he’s traded the team getting him would be on the hook for probably $5-$6 million, unless the Phillies pick up some of the tab. I doubt the Orioles would have a problem picking up his remaining salary for 2013, especially if it means giving up less in prospects, but the money may be a hurdle for other teams (I’m looking at you, Oakland). Finally, since Utley will be a free agent after the season, he would only be considered a rental, and teams are less willing to give up their better prospects for rentals. The Orioles farm system is strong at the top, but not very deep. However, I think there is enough talent there to get Utley if they want him. Even though they’re both injured, I don’t believe the Phillies have any shot at getting Jonathan Schoop or Dylan Bundy in the deal, and Baltimore would be foolish to even consider them. If the Phillies would be able to get left handed pitcher Eduardo Rodriguez (ranked 100th overall and 4th in the Orioles system prior to the start of the 2013 season by ESPN’s Keith Law), I think they should be thrilled, but Baltimore may not want to give him up either, and they wouldn’t be crazy for thinking that. I’m not going to expand on exact hypothetical trades since it’s essentially a fool’s errand, as it’s impossible to predict, since I don’t know what organizational needs are exactly or how each team values it’s own (or other) players. If Utley does end up wearing a uniform other than Phillies pinstripes come August 1st, there will be a mix of emotions. On one hand, seeing him play for another team will be tough, but on the other, it is the best thing for the future of the Phillies organization. And if he is traded, a part of me will definitely have a routing interest in that team the rest of the season. If that team happens to be the Orioles, then that will be even better.